PARIS --- France and Germany have today reinforced their post-war partnership by signing a new ‘Treaty on Cooperation and Integration’ in Aachen, Germany, which updates and extends the Elysée Treaty, also signed on this date in 1963, and which laid out the road plan for their 60-year partnership. The treaty was signed today by French President Emmanuel Macron and German Chancellor Angela Merkel in the German city of Aachen, known in France as Aix-la-Chapelle. It covers many aspects of bilateral cooperation, but this story concentrates on defense aspects. The new treaty notably extends the bilateral defense relationship, and has caused some other members of the European Union to express fears that, with Brexit disposing of the third European defense heavyweight, the French-German “couple” will come to dominate EU defense and security, and could absorb the lion’s share of the European Union’s growing R&D funds. Below are the treaty’s main defense provisions, selected and translated by D-A.com. It is of note that these aspects are covered in the fourth of the treaty’s 28 articles, thereby illustrating the primacy of defense and security issues. While generally supportive of the initiative, observers in France note that the treaty is being signed at a time when both nations’ leaders are weakened politically. It also is possible that some of its provisions will not be ratified by both parliaments, as required before the treaty comes into force. Deployment of German troops on French combat missions, for example, is likely to be questioned by German opposition parties and public opinion, while the promise that both countries “will develop a common approach to arms exports with regard to joint projects” will raise many hackles, as German public opinion generally opposes arms exports. In November, Berlin was forced to suspend arms sales to Saudi Arabia and Yemen, both involved in a regional war, under popular pressure after the murder of Saudi opponent Jamal Khashoggi, and measures to liberalize German export controls to accommodate France’s more liberal export policies are likely to inflame public opinion. Exports of weapons jointly developed by France and Germany are governed by the Debré-Schimdt agreement, signed in 1971 by the two countries’ then defense ministers, Michel Debré and Helmut Schmidt, and which stipulates that each country will allow the other to export weapons developed in common. “Under pressure from the Social Democrats (SPD), implementation of the agreement was lifted in the last legislative period. We need a new export agreement with France, otherwise there will be no joint arms projects. The SPD must show whether it really takes more Europe seriously,” Matthias Wachter, a department head at the Federation of German Industries (BDI) tweeted in reply to a question on the need for new export rules. Finally, some observers in France question why the very existence of the treaty was kept secret until early January, when the full text was quietly released on the Elysée website, and this unusual lack of publicity gave free rein to opponents to expound various conspiracy theories that have gained traction in some opposition circles. Opinion in Germany appears somewhat more supportive. “The Treaty of Aachen sends a strong signal: Cooperation between Germany and France must resume speed. Europe desperately needs this departure," Joachim Lang, the Chief Executive of BDI, tweeted this morning. The full text of the treaty is available (in French and German) on the Elysée Palace website. French President Emmanuel Macron and Chancellor Angela Merkel on Tuesday signed a new friendship treaty that is designed to deepen the Franco-German friendship, bring ties to a "new level" and improve the lives of citizens in both countries. 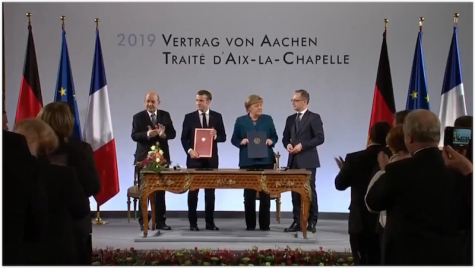 The Treaty of Aachen will be the "foundation of cooperation between our countries," said Merkel before the signing the new friendship pact. "Seventy-four years, a single human lifetime, after the end of World War II, what seems self-evident is being called into question again," she said. "That's why, first of all, there needs to be a new commitment toward our responsibility within the European Union, a responsibility held by Germany and France." French President Emmanuel Macron hit out at those "spreading lies" about the treaty and stressed the importance of French-German reconciliation. "Those who forget the value of French-German reconciliation are making themselves accomplices of the crimes of the past. Those who ... spread lies are hurting the same people they are pretending to defend by seeking to repeat our history," Macron said. Germany is already France's most important economic trading partner, but now the two countries plan to move even closer together and create a Franco-German economic area, cutting back on bureaucratic hurdles. "Together, we are better than each of us alone — not only on a joint domestic market, but also with common rules in commercial law, insolvency and company law, and with identical assessment criteria for corporation taxation," Andreas Jung, head of the Franco-German Parliamentary Group in the Bundestag, told DW. The renewed Elysee Treaty also focuses on Franco-German defense cooperation and the fight against terrorism — and here, the countries have already come a long way. A joint military unit, the Franco-German Brigade, was created in 1989. It has, however, lost some of its significance in recent years, and plays no major role in the countries' day-to-day military routines. Moving from visions to concrete defense projects has always been difficult because of the nations' diverging philosophies: The French are more likely to opt for intervention, while the Germans are very reluctant on the military stage. That should improve, however, as Germany and France have pledged assistance — including military assistance — "in the event of an armed attack" on one of the two countries. Prosperity in the 21st century is closely linked to the digital revolution, and the partner countries also want to initiate a "digital union." US giants including Apple, Google and Amazon dominate this market, but lawmakers have urged Germany and France to try to set up a Franco-German center for artificial intelligence to support European companies directly or indirectly with taxpayers' money.